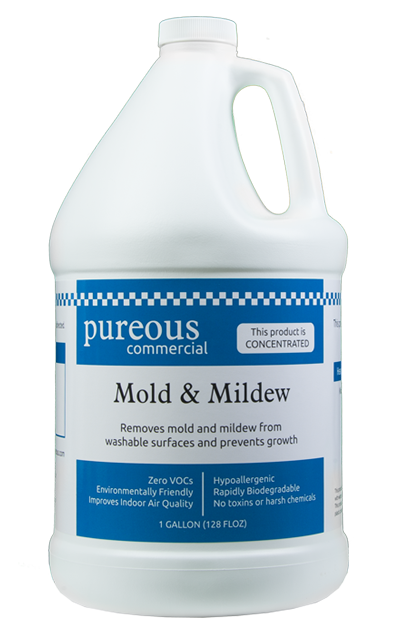 PureousTM Mold & Mildew is a revolutionary new product that works by use of PureousTM powered technology that cleans at the molecular level. This unique product creates an environment that is inhospitable to mold and mildew growth. 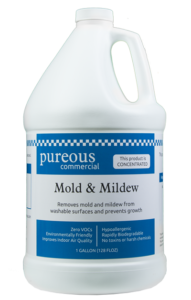 PureousTM Mold & Mildew uses a combination of silicate encapsulation and dehydration to create an environment that mold spores cannot thrive in. The dehydration does not allow the mold to live or spread without using harsh and toxic moldicides or biocides agents. The silicate encapsulation holds the dehydrated mold spores greatly reducing the airborne hazards. It also has been shown to prevent the rapid regrowth of mold because of the dehydrated surface left after treatment.